Life Routes: Cyprus... Bringing untold Stories to Life! YouCitizen invites you to first public screening of short videos from across Cyprus. 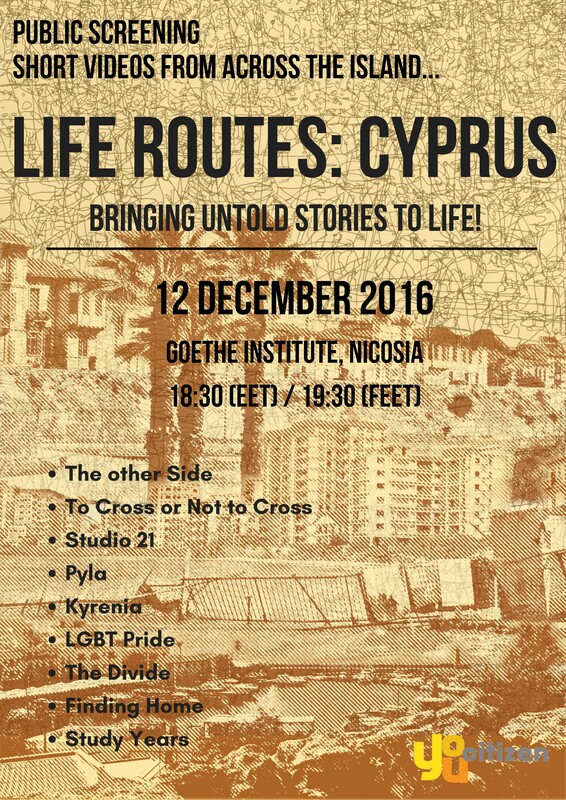 A participatory mapping project involving 5 young people from across the Island, Life Routes: Cyprus explores how young people make sense of their lives and their futures in places that have been divided or strained by conflicts of various kinds. Through a personal exploration of their relationship to particular places, the 5 youth researchers gathered stories, memories, views, and experiences from a diverse array of people and communities throughout the island. These narratives have now been brought to life in the form of 9 short videos! Don’t miss the chance to watch these open and honest narratives at a free public screening at the Goethe Institute on 12th December 2016 at 18.30. After the screening, the young people involved in the project will share their experiences and talk about the themes, places, and people featured in their stories. A reception will follow.